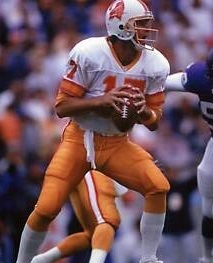 A Bucs quarterback in the 1980s and 1990s, after the 49ers gave up on him in the 70’s, Steve DeBerg is best known for being the oldest quarterback to ever start an NFL game. DeBerg was 44 when he suited up for the 1998 Falcons. And it was no gimmick. Those Falcons went 14-2 and were en route to the Super Bowl. DeBerg was on WDAE-AM 620 recently and told the story about how he retired after the ’93 season and was coaching quarterbacks for the Giants. Apparently during a local Tampa Bay area chat, perhaps over beer and chicken wings, one of the Hooters founders coaxed DeBerg into making a comeback. The thought got his juices flowing and he believed he could be a bit of a player-coach (a No. 3 QB) for the Falcons under head coach Dan Reeves, with whom he coached under at the Giants. DeBerg explained he surprised himself by winning the backup job and ended up playing in eight games with one start. It was a very cool slice of history shared by a guy who logged six of his 21 seasons in Bucs orange. But DeBerg, who still lives in Hillsborough County and trains quarterbacks privately, also talked about the current Bucs. He’s got plenty of ties at One Buc Palace. He was starting quarterback for the Chiefs when various Bucs coaches were on staff there, including a running backs coach named Bruce Arians. 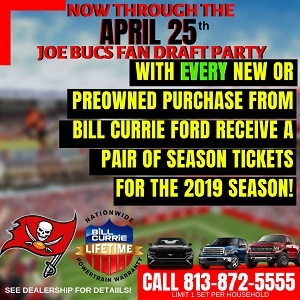 In 2003, DeBerg explained, he was coaching quarterbacks heading to the NFL Draft at IMG Academy in Bradenton, and he was assigned to new Bucs offensive coordinator Byron Leftwich and Tony Romo. Leftwich and DeBerg watched endless film together, DeBerg said, because Leftwich was still recovering from his famous broken leg that he had late in his career at Marshall. Arians made it clear that he welcomes former Bucs and other ex-players to One Buc Palace to learn from them and to talk ball. So Joe is wondering if DeBerg might get in the mix this offseason considering all those connections and Arians publicly commenting about Jameis Winston’s shoddy mechanics. I’m a supporter but don’t you think it’s quite odd that our “Pro-Ready” #1 overall pick is needing a multitude of coaching? I guess one assumption is that Bajakian & Koetter simply didn’t do a very good job. The other could be that JW isn’t very coach-able. LOL…Deberg was a great ball handler…..once got out of a DUI situation by handing the ball off to the guy that pulled him over…. What I’m pointing out is that Jameis has Christensen, Leftwich, Arians…..and there is talk about bringing in a Veteran Backup like Flaco to help mentor Jameis. The next thing we know…..we’ll opt to keep Djax so he can help Jameis with his long ball and chemistry. I doubt jameis, I mean crabman, could relate to him. How are there so many QB coaches teaching privately in this area and #3 still possess such poor mechanics? Think of JW needing a mechanics first QB coach like a Professional Golfer using a private coach. Make sense? QB mechanics slip, need a coach to keep them on point. No need for trolls with “fans” like these.